Staff Sergeant Ryan Pitts, an Afghanistan veteran and Medal of Honor recipient, gave an address on leadership Thursday, Nov. 8, as part of a series of Veterans Week events at the University of Southern Maine (USM). Pitts, who joined the U.S. Army at the age of 17, served as a Forward Observer in the 2nd Platoon, Chosen Company, 2nd Battalion (Airborne), 503rd Infantry Regiment, 173rd Airborne Brigade during the events leading up to an attack on U.S. Armed Forces in Afghanistan in July 2008. In the early morning hours of July 13, 2008, Pitts had been performing perimeter security at Observation Post Topside in the village of Wanat, Kunar Province, when an Anti-Afghan Force of more than 200 attacked the post, gunfire raining down from the north. There were just 48 U.S. soldiers stationed at the post. Pitts was injured in the gunfire, sustaining deep shrapnel wounds to his arms and legs, but he was able to pull himself up and take command of the observation post, firing off hand grenades at the approaching enemy forces. Still bleeding at a deadly rate, Pitts continued to fend off the onslaught while awaiting a two-man reinforcement team. He relinquished his main weapon to them, gathered ammunition and crawled to a radio, providing information to the command post even within earshot of the enemy. 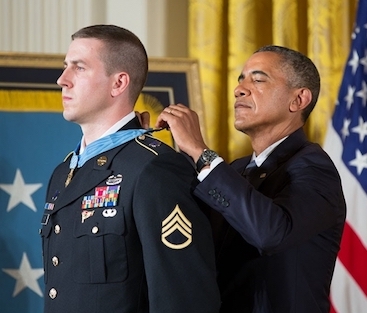 For his bravery, he was awarded the Congressional Medal of Honor by President Barack Obama on July 21, 2014, just after the 6-year anniversary of what became known as the Battle of Wanat. But he remains humble, crediting the courage of his fellow soldiers for fending off the enemy forces. “Every single guy out there fought like an absolute warrior,” said the twice-deployed Nashua, New Hampshire native. “I can tell you that all I was trying to do that day was keep up with the guys around me. “Valor was everywhere that day,” he added. Ultimately, nine U.S. soldiers perished in the assault; 27 more were wounded. More information about the battle, plus an interactive recreation of the events, can be found on the U.S. Army website. Pitts’ address was just one of several Veterans Week events in the days preceding Veterans Day on Sunday, Nov. 11. On Monday, Nov. 5, USM President Glenn Cummings and others designated a parking spot in the Sullivan Gym lot specifically for Purple Heart recipients. On Friday, Nov. 9, there will be a reception at the start of the Women’s basketball season on the Gorham Campus and volunteer work on Nov. 12, when students will aid efforts to identify veterans’ graves at Evergreen Cemetery. With over student than 300 student veterans — more than any school in the University of Maine System — USM has a wide range of resources for those leaving the Armed Forces and entering the college sphere. These include the office of Veterans Services, an on-campus resource for veterans, service members, and their families to help ease the transition from combat to classroom, including navigating government benefits. Additionally, USM is home to Maine’s Veterans Upward Bound (VUB) program, a federally-funded pre-college program that provides assistance, at no-cost, to eligible veterans who wish to pursue a college degree. VUB, offered through USM’s TRIO programs, is designed to develop the academic and personal skills necessary for admission into the post-secondary program of the veteran’s choice.